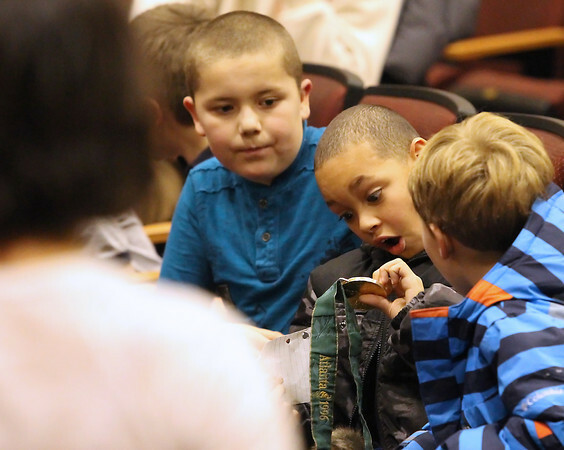 Central Grade School third-graders, from left, Elijah Boomer (cq), Bryce Hoskins (cq) and Josh Klassen examine the gold medal Sheila Taormina won in 1996 during her visit Friday. Taormina, the first woman to qualify for the Olympics in three different sports (swimming, triathlon and modern pentathlon), spoke about working towards goals, proper nutrition and other lessons she learned while training for her events. The Michigan native won gold in the 1996 Olympics in Atlanta as a member of the women's 4x200-meter freestyle relay.